For this week’s Sunday Scripture, I was inspired by the gospel during mass. This story, the Parable of the Dishonest Steward, is one I’ve heard many times growing up going to church every week; it’s a story that everyone can relate to because we all have times when we are dishonest or not as generous as we could be. You can read the full readings and gospel here, but the basic message is that we should be honest with ourselves and others about things owed and not to be greedy. For my reflection, I will use the shortened version of this reading, shown below. 8 For the children of this world are more prudent in dealing with their own generation than are the children of light. 9 I tell you, make friends for yourselves with dishonest wealth, so that when it fails, you will be welcomed into eternal dwellings. 10 The person who is trustworthy in very small matters is also trustworthy in great ones; and the person who is dishonest in very small matters is also dishonest in great ones. 11 If, therefore, you are not trustworthy with dishonest wealth, who will trust you with true wealth? 12 If you are not trustworthy with what belongs to another, who will give you what is yours? 13 No servant can serve two masters. He will either hate one and love the other, or be devoted to one and despise the other. You cannot serve God and mammon. The message of this passage relates to so many different situations, and I think that’s why I enjoyed listening and reflecting on it. The premise of trustworthiness can be applied to being a dependable employee, student, or friend. For me, the comparison in verse 10 struck me as useful advice in thinking of what makes a good friend, in both the friends I have and in being a good friend myself. Someone who gives attention to the “small matters” will also give attention to the “great ones”. If you read either of my last two posts, you saw how the little things mean a lot to me, so I liked how this passage holds big and small things with great importance. I understood this as a sort of test as to what type of friend you can trust. Someone who is honest and reliable in the small, day-to-day things will probably also be honest and reliable in the bigger things, but someone you can’t trust for even the smallest things can’t be trusted with anything major. Other things that came to mind when I listened to the passage were the trust issues that plague our generation because of insecurities through social media. Whether it be us wondering who someone is texting or who is commenting on someone’s pictures, it’s become common for us to be untrusting in these “small” ways. But what does this show for our trust on a greater scale? Because of this, it’s easy to become untrusting in the little things, which would, by the logic of the passage, also make us untrusting in the greater sense. The last verses have a strong message of their own, that “no servant can serve two masters”. The priest talked about how we serve other “masters” besides just “God and mammon”. Things like TV, jobs, the internet, or video games can also dictate our use of time. It challenged the way I think to consider these things potential “masters”, but in the end, what matters is which one we choose to serve above the rest. 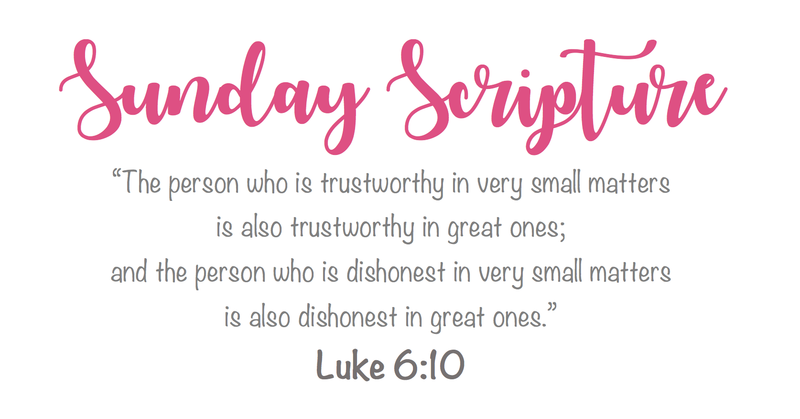 This week, I hope to continue to reflect on this scripture and think about how I can be more trustworthy in my daily life, as well as paying more attention to what “master” I am serving and to what I am giving my time.